In the previous chapters the sub-optimal Hankel norm approximation problem was solved for various classes of infinite-dimensional systems under the assumption that A generates an exp onentially stable strongly contin uous semigroup. How ever, there exists an important class of systems with a transfer function G ∈ H ∞(ℂp×m), for which A does not generate an exponentially stable semigroup (see Examples 3.1.1, 3.1.2 and 3.2.4). In 37, approximating solutions to the optimal Hankel norm approximation problem were obtained without assuming exponential stability, but only for the case that the Hankel operator is nuclear, which is a strong assumption. 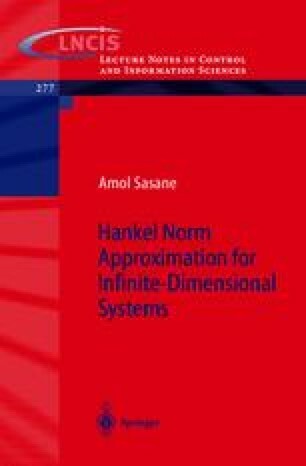 In this chapter, we will solve the sub-optimal Hankel norm approximation problem for non-exponentially stable infinite-dimensional systems in terms of a solution to the sub-optimal Hankel norm approximation problem for an exponentially stable system which is obtained by shifting the generator of the semigroup of the original system.